RESERVE YOUR PRIVATE BEACH HOUSE NOW? Modern spacious 600m, 4 bedroom beach house located on your own marine reserve. Enjoy your no fuss holiday in your own private beach house at Out of the Blue Fiji. Relax, put your feet up, take in the ocean sea views from this spacious 600 square metre beach front private house 20 steps from a protected marine coral reserve. Browse our availability and accommodation views to make your reservation. We offer great value return airport and local transfers also daily Chef services for an additional cost, enquire also on 4 (AUD$399) or 2 (AUD$249) person stays. Free wifi up to 5GB. Enjoy your own private beach house. View for more photo's of your beach house and location. (Note Homeaway are still working on moving our google maps pin onto the beach - we are not up the hill as shown currently). 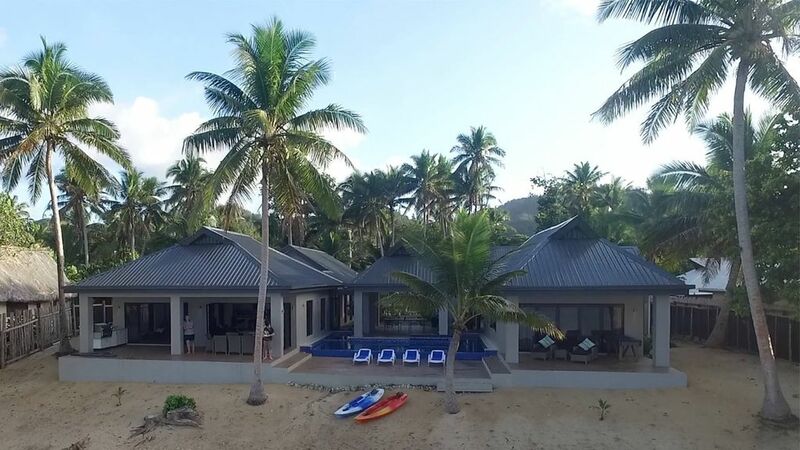 Enjoy the weather patterns (warm to hot), beach front location of our private house and Fiji experiences that can be shared. A beach front location with spacious modern design to suite most people. Originally a very large home for two that became a family home for visitors to stay. Beach front while being able to catch the breeze to cool you down in most spots. Our beach front paradise with plenty of shade as well. Google map incorrect on Homeaway. We are on the beach front. In google maps search for out of the blue fiji home. You will be 20 steps walk into the water. Gourmet and stocked for use. Outside on deck or beach areas. Your own beach house on a beach front location.